I got this reel a few months back to play with. Not being a fan of what Shimano has been producing recently, I decided to grab one of these since I found it for a good price. I played with the Citica I to get a feel for the platform, and am glad I grabbed the Scorpion, as its a really refined machine. I havent dont anything to the reel, I just wanted to fish it straight out of the box. Lets be honest, its a JDM counterpart, so its already got the better spool bearings. 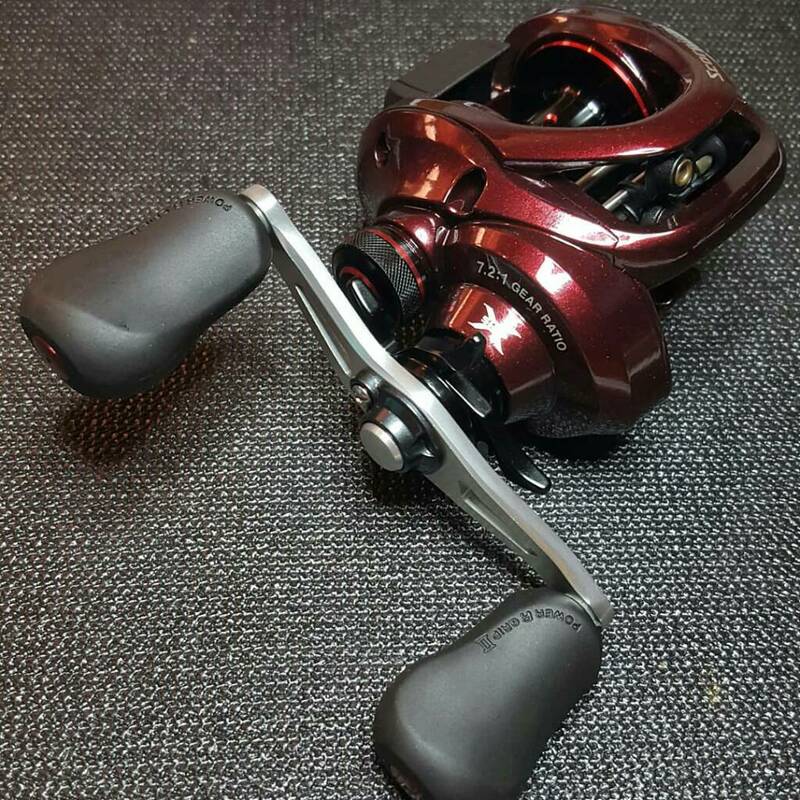 The only thing I did was change the silver handle (which didnt match the rest of the reel) to a black one. 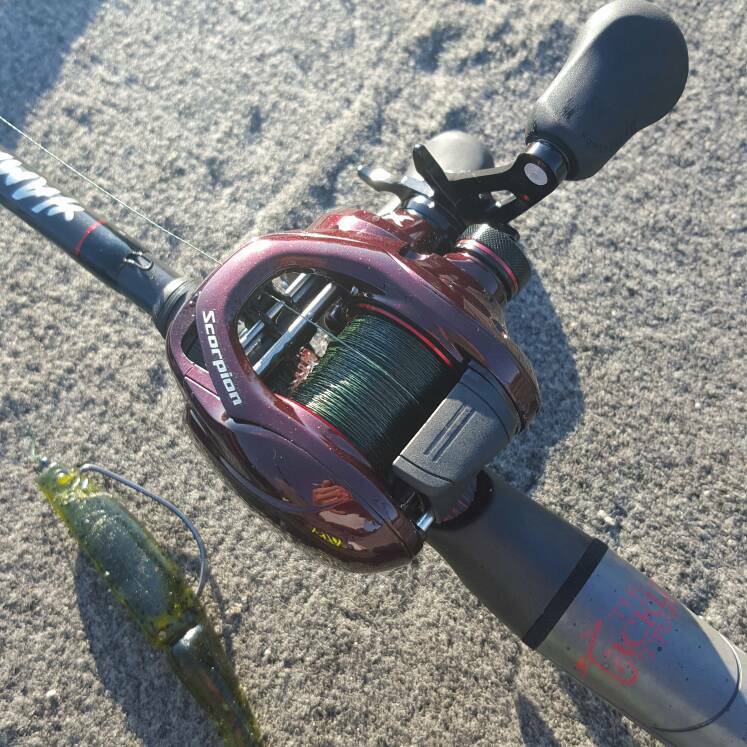 I spooled the reel with 50lb Maxcuatro, and its a swimbait slinging machine. Very smooth on the retrieve, and a simple swab of oil on the brake pipe made it a rocket to cast. So far Im pretty happy and impressed with the overall looks and performance of the reel. Drag is smooth and tight, no slop in the mechanics, and feedback is very snappy. Looks awesome! The monkey is around the corner... I keep feeding it "smalls" to keep it content, but one day it's gonna want a JDM reel. Got a really good opportunity to put this reel through the ringers today. 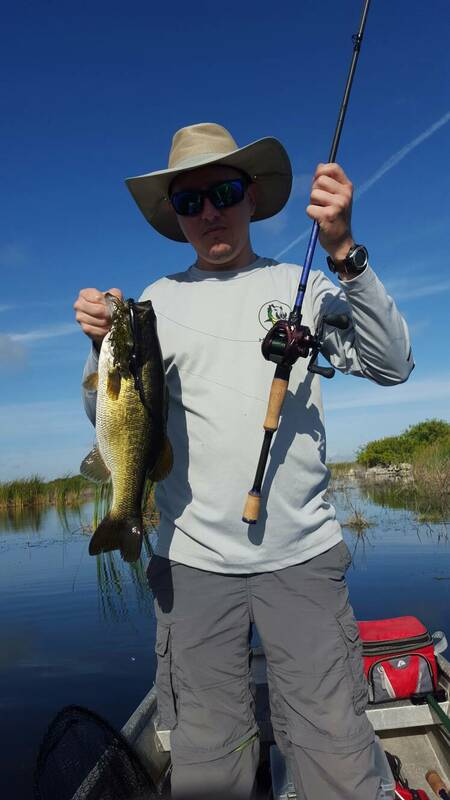 Multiple fish in the 2 to 4lb range, and trucking in cover. This reel didnt disappoint at all. Im really liking it for what it is. Its a decent cast reel, thats smooth all around. 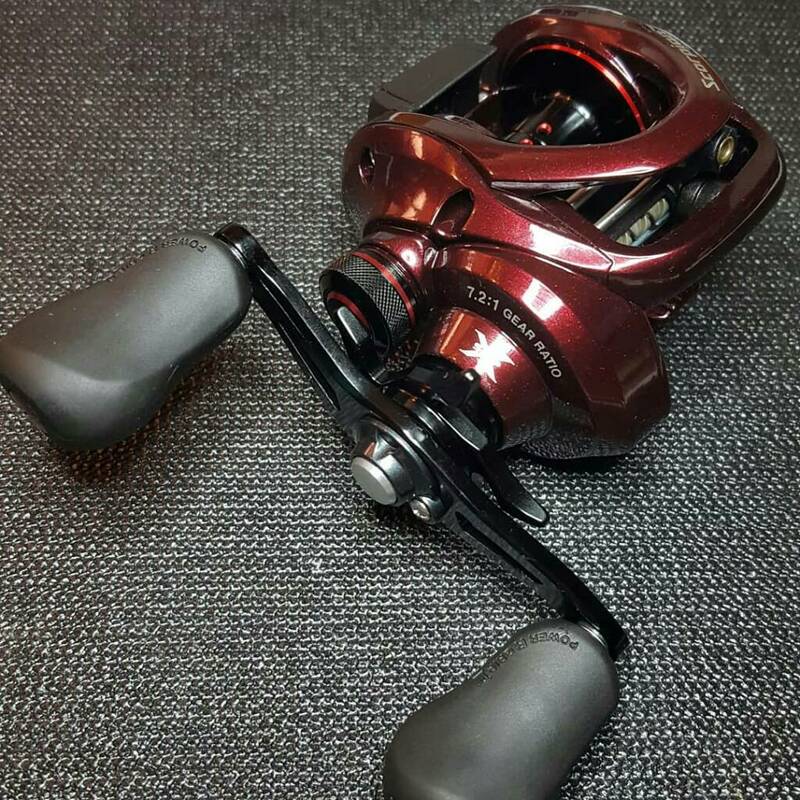 The only downfall is the lack of control I feel with the Infinity SVS system compared to a Daiwa Magforce system. 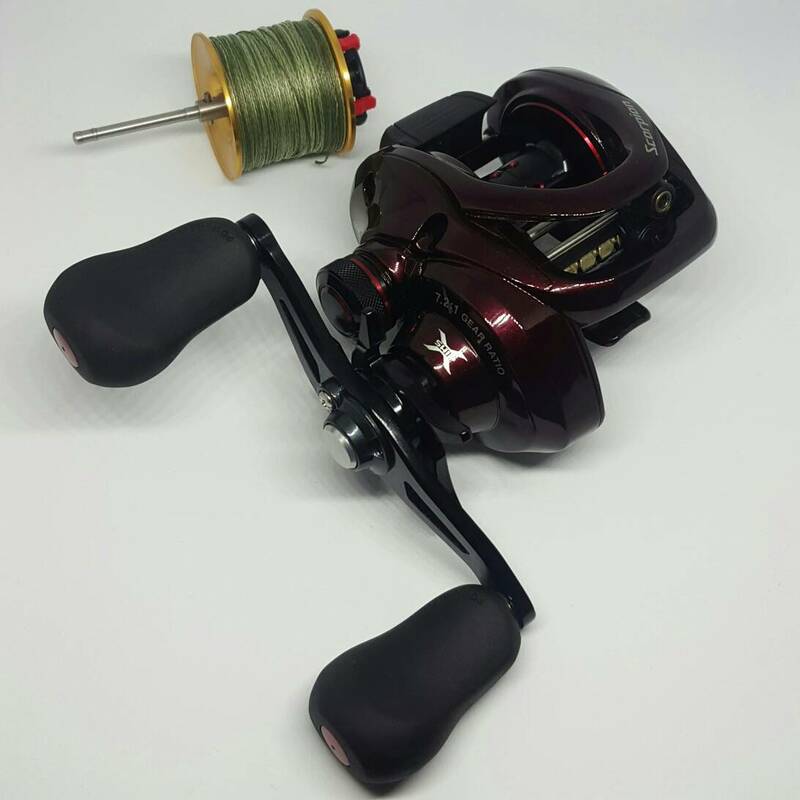 Maybe I just like the overall braking of the Daiwa better. Either way, its a great reel, and glad to have it in my arsenal. I had one of these back whenever they came out and I always loved that reel. More so than my I series Curado's. Definitely a worthy reel of keeping, but I sold mine whenever the Chronarch MGL came out. Its nice for sure. My main gripe with it is the bulbus palm plate. Because of the SVS Inf brake design, it causes them to have to make it bulge out. If they would have just stuck to the VBS, it wouldnt be so awkward. Matt that Scorpion I got you is super smooth, casting distance is better then most I have had. I love using the reel, the only criticism is the weight of the reel. It is a little bigger then most, and a little heavier, for my hands not a problem. I still use it often, and would not give it up. Thats a classic of a reel, and based off the Curado200B. Still one of the best casting reels to date, but yes, bulky. When I was putting the TDZ away from todays outing, I looked down at my 14Scorpion. I asked myself why I havent used it as much as I was intending to when I bought it. Hell, I even have a Citica I to use as a parts reel for it if ever needed. Then it dawned on me, the Citica I spool! I havent used the 14Scorpion because I had it spooled with 50lb braid. As Im trying to do some shying from braid (again), thats why I havent really used it. It got a good workout when I took it out to the reservoir with my friend Josh, but I needed to still test it. So, back to the Citica spool, I had 50lb braid on it. Snatched it out of the Citica and put in the spool case. Took the 50lb braid off the 14Scorpion spool, and put that to my OG Tatula. An empty stock spool, that needs some mono. Trying to keep off the 0.013 diameter on this reel, I needed thicker. I had 0.014 of the Trilene XT thats a 10lb, but I wanted to try a little thicker to toss 1/4 sinker with a plastic. I still had a spool of 17lb Sufix Siege. Thats a 0.016 line, so lets give that a go. My next outing I should have something now to look forward to. 2 tests, the 14Scorpion with the 0.016 mono, and the actual mono itself.